The Guide to Rocks and Minerals appeals to rock hounds from amateur to science teachers. It is a comprehensive reference on the state’s rocks and minerals, with more than 40 color plates that display excellent examples of rock types ranging from fluorite (the state mineral) to the world-renowned geodes of western Illinois. The photographs are accompanied by detailed descriptions of both common and very unusual rocks and minerals in Illinois. Useful identification flow charts and keys help the reader identify their specimens. In addition, the guide summarizes the basic geology of Illinois and discusses the physical properties of rocks and minerals, ways to collect and identify samples, and the importance of rocks and minerals to society. The Beginning Fossils Guide includes full color photographs of fossils and rocks and additional fossil drawings and plates. The Guide to Illinois Caverns is as close to an actual tour as one can get due to Illinois Caverns being closed to the public due to the white-nose-syndrome (WNS) that is devastating the bat population across the country. Through this guide you will be able to imagine the cave feature by feature, and, along the way, you'll learn about the area's unique karst terrain, the plants and animals of the area, and the processes that formed and continue to change the caverns and surrounding area. Illinois' Ice Age Legacy, Illinois Groundwater: A Vital Geologic Resource, and Land-Use Decisions and Geology: Getting Past “Out of Sight, Out of Mind"
Using easy to-read text and understandable diagrams, the authors of the Geo-science Education series give readers an excellent introduction to the legacy of glaciers, groundwater and land-use decisions in Illinois. Learn about the glacial processes and events of the great ice age; how geologic information about the glacial deposits can improve societal decisions related to groundwater and land use; and how understanding a location’s geologic framework and contamination potential can help society make safer, more cost-effective decisions about land use. Second Revised Edition, Geoscience Education Series 14. Text, maps, and photographs have been updated in the 2007 revision of the ISGS classic, Illinois' Ice Age Legacy, Geoscience Education Series 14, by Myrna M. Killey. The 74-page book serves as an excellent introduction to the legacy of the glaciers that advanced and retreated across most of Illinois within the past 1.8 million years. During that time, the glaciers endowed the state with deposits that today provide a wealth of natural resources: fertile soils, water, sand and gravel, natural gas, and peat. The book describes the glacial processes and events of the Great Ice Age and details the kinds of evidence geologists study to learn about the glaciers and their deposits. Understanding the nature and extent of these deposits is essential to addressing societal issues related to land use, water quality, mineral resources, and geologic hazards. 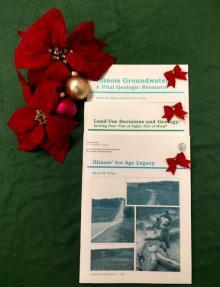 Illinois' Ice Age Legacy is the initial volume of a published trilogy that includes two companion publications, Illinois Groundwater: A Vital Geologic Resource and Land-Use Decisions and Geology: Getting Past AOut of Sight, Out of Mind. The latter two books illustrate how geologic information about the glacial deposits can improve societal decisions related to groundwater and land use. Myrna M. Killey and David R. Larson. 2004. 61 pp. Learn more about an essential Illinois resource we often take for granted and sometimes misunderstand. Using easy to-read text and understandable diagrams, the authors explain what groundwater is, how groundwater is influenced by its geologic framework, what kinds of materials make up aquifers, and how water moves underground. The text also discusses how water supplies are located and retrieved, well types, well maintenance, groundwater quality, and other issues. Understanding how critical groundwater is to Illinois is the first step in managing and protecting this valuable resource. Myrna M. Killey and Richard C. Berg. 2004. 68 pp. The impacts of the state’s large population and its industrial and agricultural bases have presented many kinds of environmental challenges. This book shows how understanding a location’s geologic framework and contamination potential can help society make safer, more cost-effective decisions about land use. 2005. 22 pp. Full color. Learn how to interpret and use standard 7.5-minute topographic quadrangle maps published by the United States Geological Survey and made available through the ISGS Public Information Office. Hikers, hunters, urban planners, and students are just some of those who will find it useful to understand how to interpret these maps. The maps use contour lines to show the configuration of the land surface. The maps also show surface waters and man-made features such as roads, dams, canals, railroads, and houses. The guide is a revision of the 1978 Guide to the Use of Illinois Topographic Maps. Specimens of typical rocks and minerals found in Illinois. Numbered cards identify each specimen and briefly explain its significance. The set is intended as a reference for science classrooms and other educational groups. Specimens are not large enough for laboratory experimentation. 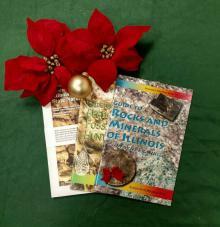 Kits includes a copy of ISGS Geoscience Education Series 16, Guide to Rocks and Minerals of Illinois. The set is available only to Illinois schools and educational groups upon request restrictions may apply and proof of educational use may be requested. ©2019 University of Illinois Board of Trustees. All rights reserved. For permissions information, contact the appropriate Survey.